LAKEVIEW, Ore. – The sun is out, flood waters have receded and cleanup has progressed rapidly in the Town of Lakeview and Lake County. All road closures have been lifted and great progress has been made to remove debris and restore stream channels. Lake County School District 7 schools reopened this morning. 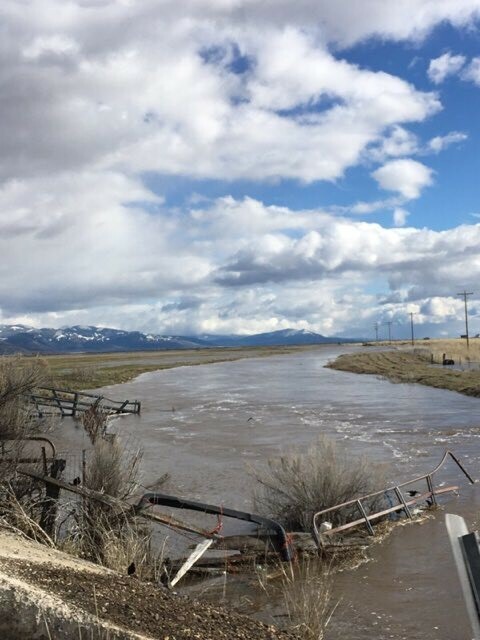 Emergency operations have gone into stand-by mode, prepared if rain in the forecast Thursday and remaining snowpack cause floodwaters to rise again. In the Town of Lakeview, pumping operations have stopped and sandbags have been moved to the side and prepositioned in case there is a need late this week. Outside of town, many fields and low-lying areas are currently flooded. Today area resources continue working on cleanup and assessing damage from the flood. Those with homeowner damage reports, questions or concerns regarding the flooding incident in Lakeview can call the Lakeview Fire Department nonemergency number, 541-947-2504. Incident managers want to express their appreciation for all of the hard work from emergency responders in the area that made it possible to respond quickly to the situation Monday night, as well as to swiftly cleanup the town and county yesterday and prepare in case it is necessary to respond again this spring. They also want to thank the public for all of their support during the incident and allowing emergency responders the space to be able to safely work to protect area residents and resources from the flood. The Town of Lakeview and Lakeview Fire Department, Lake County and the Lake County Sheriff’s Office, Thomas Creek-Westside Rural Fire Protection District, Oregon State Police, the South Central Oregon Fire Management Partnership, Lake Health District Hospital, Lake County School District 7, Oregon Department of Transportation, Warner Creek Correctional Facility and Oregon Department of Forestry are working together on this emergency situation. Unless there is a significant change in conditions, this will be the final update for this incident. For more information on SCOFMP, please visit www.scofmp.org, on Twitter @scofmpfireinfo or on Facebook at http://facebook.com/scofmpfireinfo.